“Let’s Get Caught” is a new one from Janelle Monae’s Wondaland Records crew. 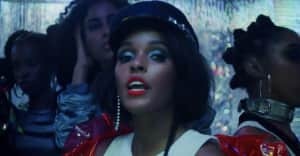 Back in February, we premiered the video for “Classic Man,” the Jidenna single that re-introduced Janelle Monae’s show-stopping Wondaland collective. Today, Wondaland duo Deep Cotton share another video, for falsetto-funky “Let’s Get Caught,” a song taken from the collective’s refreshing August EP. "On every planet, in every galaxy, across every alternate reality that there is: it just feels so damn good to be bad—end of story,” Deep Cotton said of the track, via email. "It's a story as old as time; we're just giving it to you in some brand new clothes. So, enjoy this song and video responsibly in the company of any man, woman, or droid you happen to want to get to know better. We promise that the world will be a better place once you do." The pool party video was directed by Sebastian Urrea and produced by Atlanta’s Motion Family. Shoutout to the woman reading Issa Rae's book, and to Jidenna, who shows up for a starry-eyed rap about a girl who wore chinchilla, classic as ever.